1Lt Samuel Minkowitz (N)(Int) - Flew on all of the Troppman crew missions. Flew 13 additional missions 10 as a Lead Crew Navigator (114, 115, 116, 117, 118, 121, 122, 125, 129, 131, 137, 138, 139, 140). Last mission #140, 24 April 1944, in B-17F #42-31669 Shoo Shoo Baby (358BS) VK-J with the 1Lt Raymond Hofmann Crew. Lost one engine in fighter attack before reaching target. Flak damaged another engine. 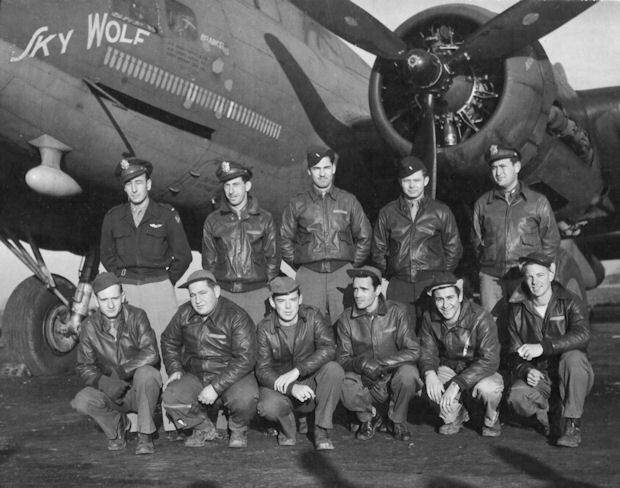 Realizing that they were badly damaged and low on gasoline the crew opted to head for Switzerland and landed at Zurich with twelve flak holes in their B-17 (MACR 4270). The Crew was interned. Capt Charles C. Armstrong (B) - Flew on all of the Troppman crew missions. Missions 108 and 109 with the Lt Arnold S. Litman Crew. Flew 18 missions as a Lead Crew Bombardier (111, 119, 123, 127, 134, 137, 141, 145, 147, 152, 158, 160, 163, 165, 169, 172, 178, 187) - 8 lead crew missions with Capt Jack W. Watson as Pilot. S/Sgt David L. Wilson (E)(A), Sgt Frank R. Mirenda (BTG)(A), Sgt Mario D. Garcia (RWG)(A), Sgt Verden D. Swank (TG)(A) - Flew on all of the Troppman crew missions. S/Sgt Daniel F. Gilmore (R)(A) - Flew on all Troppman Crew missions except #101 where a substitute Radio Operator was used. Sgt Nathan Sweed (LWG)(WIA) - Mission #83 was the only mission flown. He suffered severe frostbite and lost three fingers on his right hand. He was removed from flying status. The Troppman Crew used substitute Left Waist Gunners for their other missions. Sgt Mario D. Garcia - Flew on Mission #115, 02 March 1944, to Frankfurt, Germany in B-17G #42-97509 Old Hickory (358BS) VK-A. For mission details see the Damon C. Elder Crew page. Capt Calder L. Wise (Orientation Pilot) - 1st Mission on 30 July 1943. Flew 15 credited missions as CoPilot with the 1Lt John W. Hendry, Jr. Crew. (56, 57, 58, 59, 60, 61, 64, 65, 66, 67, 68, 69, 71 (Aborted), 72, 73, 74). Upgraded from CoPilot to Pilot on orders dated 10 October 1943 and flew his first mission as 1st Pilot on 8 October 1943. Flew ten missions as 1st Pilot: Seven missions with 2Lt William C. Fort, Jr. as CoPilot (75, 76, 77, 78, 79, 80, 81); Two missions with 2Lt Walter W. Troppman as CoPilot (83, 84); One mission with 2Lt Robert W. Snyder as CoPilot (118).